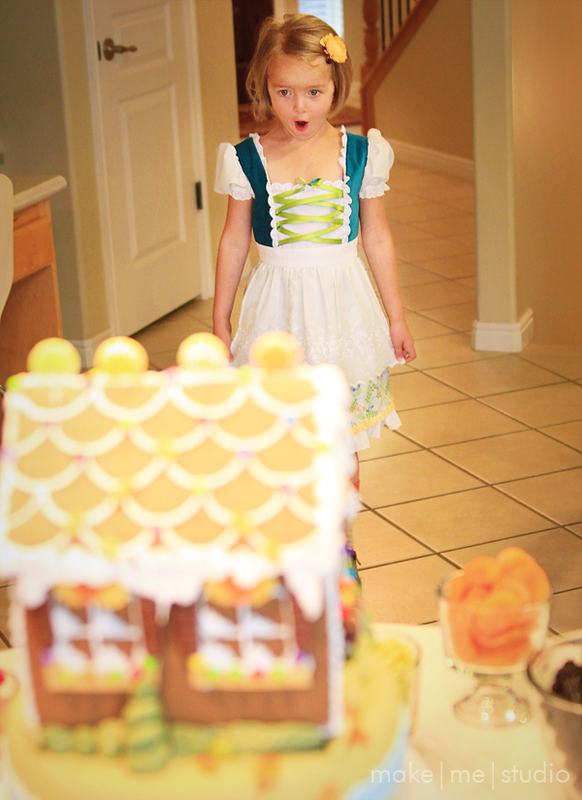 For monkey pants' 6th birthday I decided on a gingerbread house sort of theme since she was dressing up as Gretel for Halloween. We made it a fairy tale costume party. I tried to keep the cake as simple as possible. I figured a nine inch round with a fondant bow around it and a gingerbread house on top made with a kit wouldn't be too much work. The only thing was that I couldn't find any gingerbread house kits. Finally on the day before the party I found some Halloween kits that I had resolved to get and redecorate. But on a last minute trip to Costco (my favorite store) I was saved by this well priced ($10.00) gingerbread house kit that was already assembled! 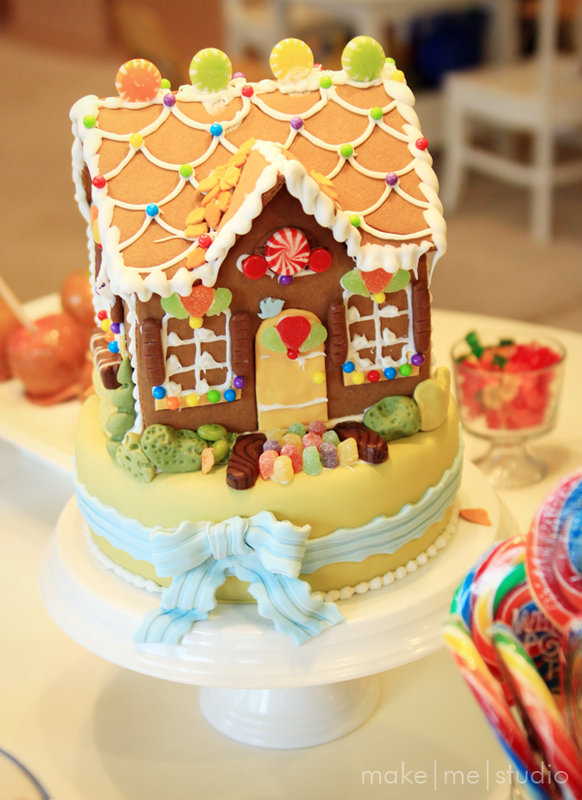 It's a Christmas one but I just added some fondant details to make it a little more Hansel and Gretel like. 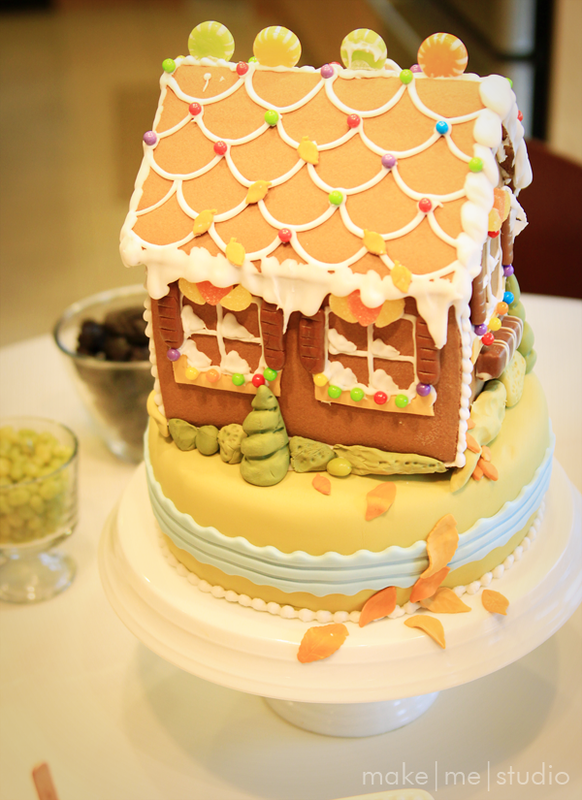 I have to admit, I was going for speed while decorating the gingerbread house and while I thought it was fabulous that the white icing was included in the kit I could not make anything neat looking with it. It took me a while to do a horizontal line successfully without it falling down and after a couple failed attempts at dots on the roof I abandoned that decorating detail. The snow on the roof, I wasn't too concerned about making it look pretty. It would have been good to have some candy canes and maybe some ladyfingers or other candies on hand to decorate but honestly, I was just happy to get done and on top of the cake. I also decided to decorate around the cake table with candy. Now, my kids have been well deprived of candy all of their short lives, so this was a big deal for monkey pants as you may be able to tell from her reaction. Apparently, not so big of a deal for the other kids who actually have candy in their kitchen pantry. 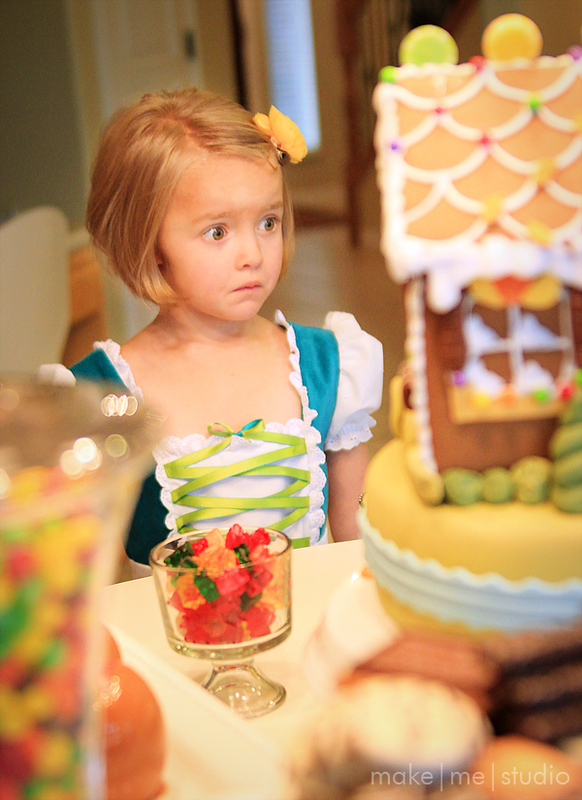 Except for the gummy bears and gingerbread man cookies -those were quite popular. And am I the only one that likes lemon drops? I think my husband tried to tell me I was old for liking them. What?! She almost has a frightened look on her face. I think she's thinking, "Holy crap, how am I going to control myself!" And then, "I'm going to eat this part first". 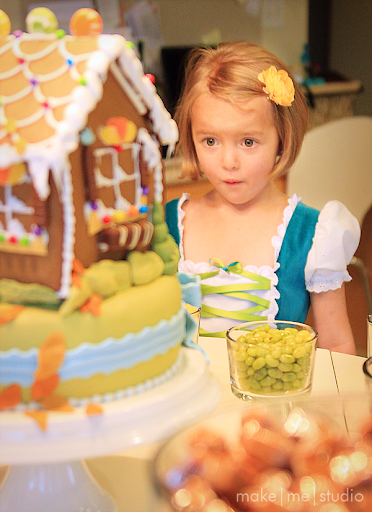 That is one AMAZING cake and the expression on her face is priceless! love love this cake!! I'm going to link to it on one of my 12 days of Christmas posts! Thanks so much for the inspiration!